I think it’s so cool that, despite the many nonsensical words and the fact that the poem has been taken out of the context of the larger story, we can still understand Carroll’s tone and even the plot. 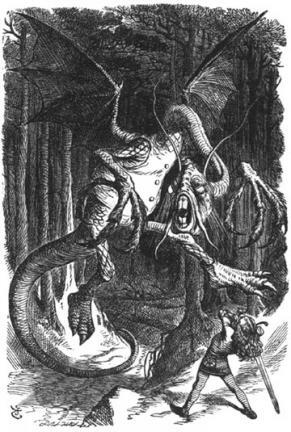 In short, the main character slays the Jabberwock, an evil beast, a great accomplishment. This sort of reminds me of the feeling of being in a foreign country in which I don’t speak the native language. To an extent, I can figure out what’s going on around me, thanks to environmental cues, tone of voice, and body language. But the details tend to be lost. Usually, this is a frustrating feeling, but I think it also contributes to noticing things that might otherwise go unnoticed (when you’re eavesdropping on one conversation on the subway, you might not notice all the other people around you). Limited language knowledge definitely colors the lens through which we perceive a place. In the case of this poem, not knowing the exact meaning of all of Carroll’s words pushes us to use our imagination a bit. While we all derive the same main idea from the words he writes, we also all have our own nuanced mental images of the scene in which the boy defeats the Jabberwock and saves his village. Reading this poem reminds me a bit of reading Old English, where some words are easily recognizable, while with others you would need a dictionary or a translator to figure out the words’ meanings. Love this poem though…makes me want to read the books and/or watch the Disney movie (shocker! ).